“…Life is meant to be lived wide open, not closed off, not safe, but living close to the Lord where he leads us…our job is to live our lives with our hands wide open…Everybody on the show [Rising Star] was like, ‘Oh, you should do mainstream. You should do pop. You should do country.’ But the day I auditioned for the show, I walked in and told them that I was a Christian artist, and this is what I believe…” if you listen to Austin French’s debut single “Freedom Hymn”, or any of his other singles such as “Why God”, “Born Again”, “Good Feeling” or “Wide Open”, you probably wouldn’t believe that he was only 24 years old. I certainly wouldn’t have believed it either. 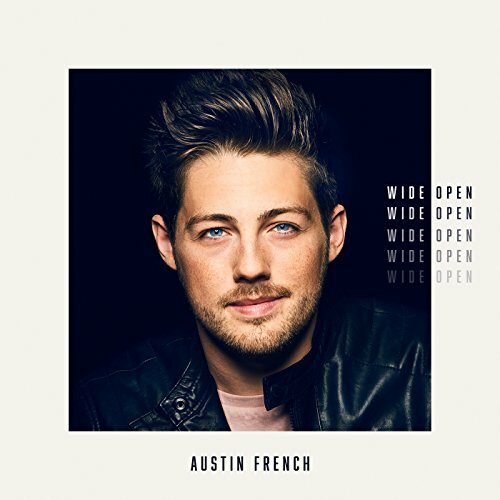 Now you would probably think that someone that young writing music this profound and heartfelt, as evidenced from many tracks on Austin’s debut album Wide Open (which released this past week); is very rare in the music industry, in any genre. I’d say you’d be right- but Austin’s journey isn’t a normal journey. In fact God has had His hand on Austin for a while now, and the plans He has for him are only starting to come into fruition right now, with hopeful and inspiring results judging from these 12 God-breathed and Holy Spirit inspired melodies. At only 24 years old, Austin, together with his wife Joscelyn, is a full time worship leader and worship pastor at The Avenue Church in Delray Beach Florida, where around 80 percent of the members were recovering addicts. Austin also had his plate full when he became father to two young boys within months of each other. These big impacting moments of his life form the basis of his inspiration for a few melodies on Wide Open, and it definitely shows here, as we can hear brutal, raw emotion and melodies we can relate to due to Austin’s personal stories being interwoven through. Opening up proceedings us the emphatic title track, driven by grunging guitars and pulsating synth and electronic effects, and co-written with as well as featuring guest vocalist Matthew West. The heartbeat of the album; Austin uses the pop anthem as a launching pad for relaying to us that with God’s plans which are bigger than ours, we need to be wide open- we need to be receptive for Him to move, even if it looks like something we wouldn’t even expect or even may not prefer. Only He knows the future and what is ultimately good for us, and “Wide Open” is a prayer that we all should be able to pray in the near future, as both Austin and Matthew fervently conclude with gusto and passion that ‘…I’m wide open, here I am, send me where You want me to go, I’m wide open, I surrender all to You, my heart and my soul…’. When Jesus says for us to go, or to stay, our answer shouldn’t be ‘why’ or ‘no’- but rather it should be ‘I’m wide open God, I’m listening, tell me what you want me to do!’. Kudos to Austin and Matthew for a compelling and confronting opener that is sure to challenge us in whether we trust that Jesus can lead the way and provide us a better future. Debut single “Freedom Hymn” is next, and is a fun 3 minute ball of energy, destined to be a hit and possibly a modern day hymn in a few years’ time. Releasing in December last year, “Freedom Hymn” could sound a bit ‘egotisical’ is you want to call it anything, as it may sound like Austin is declaring ‘oh this is what I think a modern hymn should sound like!’, but a look deeper reveals a humble heart and a passion for Jesus that is unwavering and so deep. With the track being soul and gospel in nature, Austin blends together a myriad of genres, as he creates his own brand of thoroughly enjoyable music, as he praises the Lord most high. Exclaiming that ‘…this is the sound of chains breaking, this is the beat of a heart changing, this is a song of a soul forgiven…’, we are presented with the notion that Austin wants to create a song that can be sung in the good times, and in the bad times, for now and into the future; highlighting the fact that we as believers can declare freedom over our circumstances, because Jesus Christ has won and He is with us all the time. And it’s also a song that we can unequivocally cry out no matter what we are feeling- and guaranteed we will feel better and more joyful after the 3 minutes and 8 seconds. The rest of the 10 tracks on the album are just as compelling and inspiring as Austin’s first two offerings. Piano only “Why God” is a personal highlight for me, as it’s just so relatable and honest; where Austin battled within himself, asking questions of God as to why certain events happened and certain events didn’t happen. Based on questions Austin was having during the adoption of his son, and the whole process which was taking a long time, as well as questions he was having while his dad was in a six-month long coma (which he miraculously recovered from and is now alive and healthy! ); what resulted is one of the most personal songs Austin has ever recorded, as he doesn’t mince words and doesn’t’ hold back, asking ‘…why God, do people have to die, a daughter or a son, sudden and so young, long before their time? Why God, do people fall apart, a promise and a ring becomes a broken thing, a road that got too hard?…’ then concluding that there are no easy answers as to why- as God may not give answers to us right away- but does provide hope to us relaying that Jesus is right there beside us, and it is in these moments where we draw on our faith and draw close to the Father as He give us healing and strength. This song may not provide comfort to those hurting, but it may- and it is this fact alone why I reckon this song deserves all the recognition in the near or far future. The tempo comes back up in the 3 minute rocker “Born Again”, where Austin tries his hand at rap, highlighting to us that we all can be born again through Jesus if we just believe in his death and resurrection; while CCM-esque radio friendly piano prominent “I Need A Hallelujah” is a prayer of thankfulness and gratitude, where Austin sings out to God that though there are valleys and there are trials and tribulations, Jesus has made a way, and for that he sings out ‘hallelujah’. Danceable jazz/soul/gospel infused “Good Feeling” is musically very creative, however lyrically seems a bit vague- Jesus is never explicitly mention as being the source of this ‘good feeling’. But the song is catchy, and hopefully those who are captivated by the song can be moved by God and covertly encouraged to check out the gospel of Jesus if they are indeed not believers yet. “Living Proof”, though solid and theologically sound, is another misstep in my opinion, as the ‘testimony’ type song isn’t that exciting musically, and the EDM doesn’t really fit here. There’s no denying the passion in Austin’s eloquent and vibrant vocals in the past couple of tracks though, and it’s for Austin’s enthusiasm that these last two tracks just pass for me. However, the hits come back with the patriotic, orchestral sounding “In America” (which isn’t really limited to America anyway! ), an earnest prayer where Austin majestically asks God to come and help revive the whole world, and make His kingdom here on earth as it is in heaven; and the acoustic guitar driven and hand claps prominent 3 minute folk melody “Bring It To You”, where Austin let us know that we can bring our everything to God, and there is nothing too big for God that He can’t handle. As Austin channels his inner Switchfoot and Skillet with the high octane “Holy Ground”, we are met with one of the most musically creative songs he’s ever done, where Austin dives into the notion that everywhere he goes is on holy ground because Jesus is in out midst, while Austin travels back to the 90’s musically with the throwback song “Break My Heart”- a potential single as Austin firmly reiterates to us that without Jesus allowing certain events to occur, he’d never know who Jesus is, that ‘…every broken road, every shattered dream, all of the times I failed, You were grace to me, now when I look back on my story there is no way I’d know who You are if You never let this world break my heart…’. The album ends with the stanza-less and verse-less and chorus-less melody “Spirit Speak”- a duet with Austin’s wife Joscelyn, an earnest prayer to the Holy Spirit, asking Him to speak to us during the times we need Him to, even when we think we may know better. “…At the end of the day, there are songs, productions, t-shirts, and a thousand small details that are a part of this journey, but the most important thing to me, and my reason for breathing, is to serve and worship my King and Savior, Jesus Christ. That’s why I’m in this. And I hope that when people hear my music or come to a show that they see and hear the Gospel in action, saving me currently and reaching out to their reality…” Becoming a star through the ABC reality TV show Rising Star, Austin French is definitely a new-ish artist to keep an eye out for. With almost every track on the debut album being favourites of mine, inclusive of tracks like “Freedom Hymn”, “Wide Open”, “Why God”, “I Need A Hallelujah” and “Born Again”; this new project is sure to take the world by storm and impact the lives and hearts of many. So what are you guys waiting for? Check out the album containing the ‘future modern hymn’ if you want to call it that, and marvel at the wonder of Austin’s high quality songwriting skills! “Living Proof” happens to be my favorite on the album, but this is a really good review! I’m still not feeling Living Proof but the other songs from Austin French are quite enjoyable.